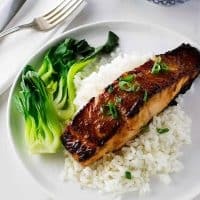 Our ginger-miso glazed salmon is an awesome salmon recipe that is great for a week-night dinner or even special guests. These glazed salmon fillets are popped under the broiler to give them a nice char of caramelized crust on top while moist and tender inside. Living in the Pacific Northwest is a great place for seafood lovers where the salmon is always fresh and always available. 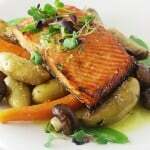 Salmon seems to be a frequent visitor at our table and it has a wide variety of preparations. We used fresh wild Coho for this ginger-miso glazed salmon recipe but it will be just as delicious with any salmon species. 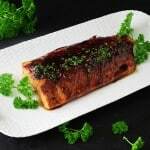 A short soak in a simple marinade of grated ginger root, honey, soy, lemon juice and white miso caramelizes the salmon under the broiler, slightly charring them and giving them a rich caramelized flavor. 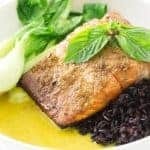 Marinating the salmon in this simple mixture in advance and refrigerating it is the key to having this easy meal on the table in a short time. Also, placing the salmon fillets on a hot cast iron skillet cooks them faster and eliminates the need to flip them at the half-way point when broiling. A pot of basmati rice was prepared in advance to accompany the salmon and the bok choy steamed on the stovetop while the salmon broiled. While the oven was preheating on broil, we heated our cast iron griddle. The salmon fillets were removed from the marinade, and after the excess marinade dripped off they were slapped onto that hot griddle and popped under the broiler for just a few minutes. The heat from the hot griddle cooked the salmon from the underside while the broiler did it’s work on top with a nice char and giving the salmon a crisp, rich caramelization. We like our salmon on the medium-rare side which will look a bit translucent in the center so if you prefer a more well-done salmon just leave under the broiler another minute or two. The skillet was removed from the broiler and the salmon was immediately transferred to a plate to rest for 2-3 minutes before plating. 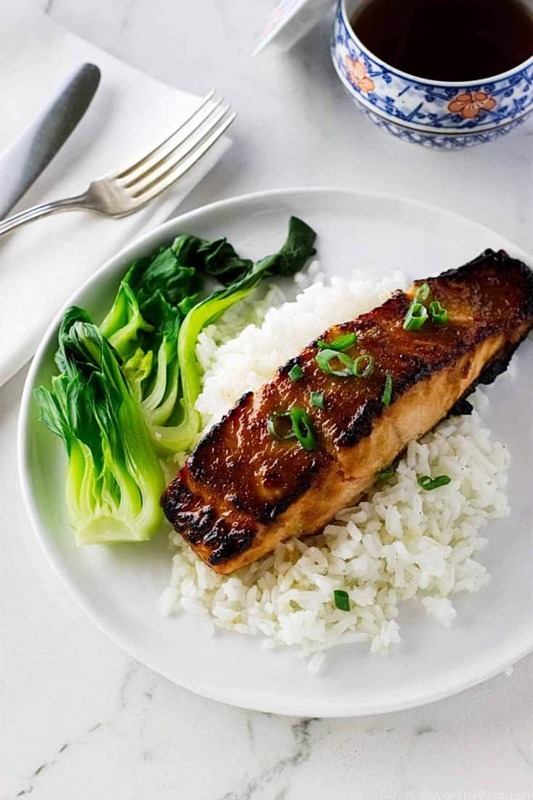 We served this ginger-miso glazed salmon with steamed bok choy and the hot balsamic rice. 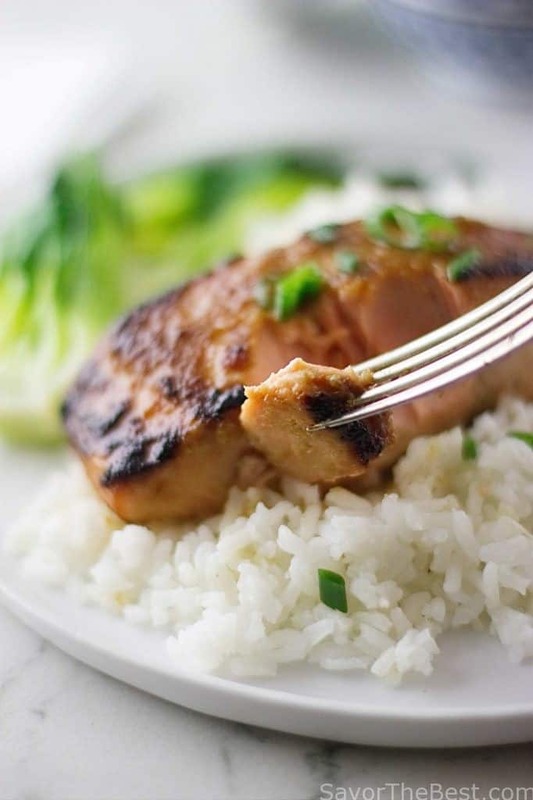 Have you made this ginger miso glazed salmon recipe? We would love to see a picture. Tag us on Instagram. In a small dish, whisk together the miso, honey, soy sauce and lemon juice until well combined and smooth. Stir in the grated ginger root. Place the salmon fillets in a shallow dish and spoon the miso marinade over them. Cover the dish with plastic wrap and transfer to the refrigerator for at least 30 minutes. Adjust the oven rack to 6 inches from he broiler unit and preheat the oven on broil for 5 minutes. On the stove top, heat a cast iron griddle or cast iron skillet over high heat until it is almost smoking hot. With tongs, remove the salmon fillets and allow excess marinade to drip off, place the salmon fillets on the hot griddle and immediately transfer the griddle/skillet to the preheated oven. Broil for 5-6 minutes. This will depend on how thick your fillets are. The fillets will be cooking from the broiler and from the bottom as well because of the hot griddle. 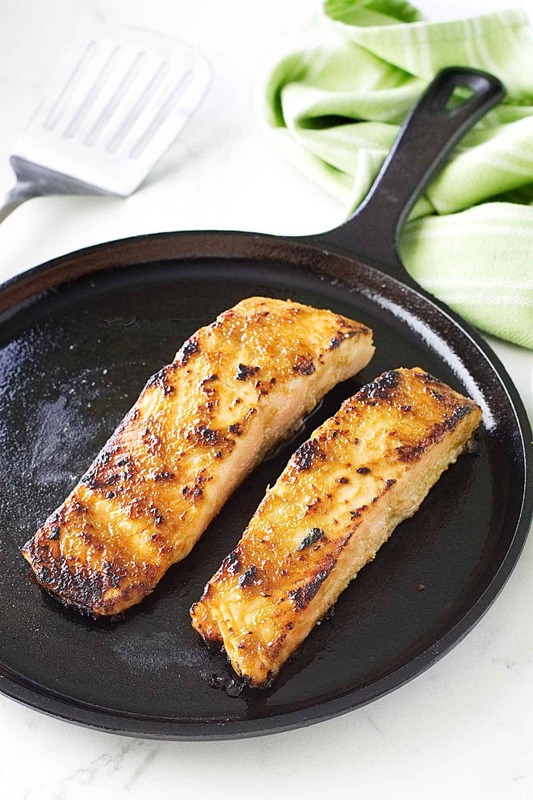 As soon as the fillets begin to char and caramelize, carefully remove the griddle from the oven and transfer the salmon fillets to a serving platter. Check for doneness, they should be moist and slightly translucent (medium rare) in the center. If the salmon fillets need additional cooking to your desired doneness, return them to the hot griddle and tent with foil for five minutes. The heat from the griddle will continue to cook the fillets. Alternatively, you can place the fillets back on the griddle and return them to the broiler for 2-3 additional minutes. Beautifully seasoned salmon! 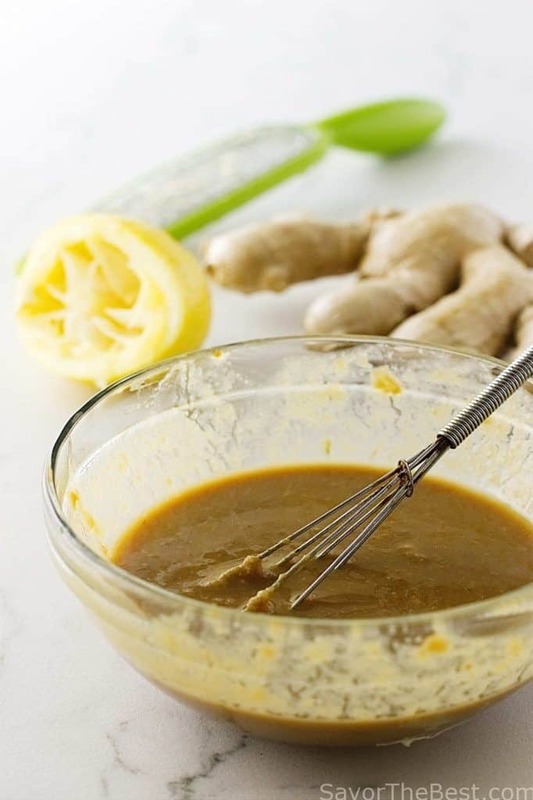 Such a simple and delightful marinade – love the combo of ginger and lemon with miso! And so perfectly cooked too. Yum! This looks so juicy and flavorful. I love that this is simple enough to make on a week night. Thanks for sharing! Luci’s Morsels | fashion. food. frivolity. I love miso salmon. I love that you used fresh ginger. What a quick, delicious salmon recipe! Definitely putting this on my to-make list! This sounds very tasty! This piece of meat looks amazing, thanks for sharing Pat and Dahn! This looks yummy, Pat! Thank you for it. Where do I get the Miso? I like my salmon medium, too — perfect way to cook it. I like mixo-glazed fish, but don’t think I’ve ever had salmon prepared this way. Great idea! At this time of the year I buy only frozen salmon, but in a couple or three months we can look forward to fresh Alaskan salmon — my favorite. Good dish — thanks.